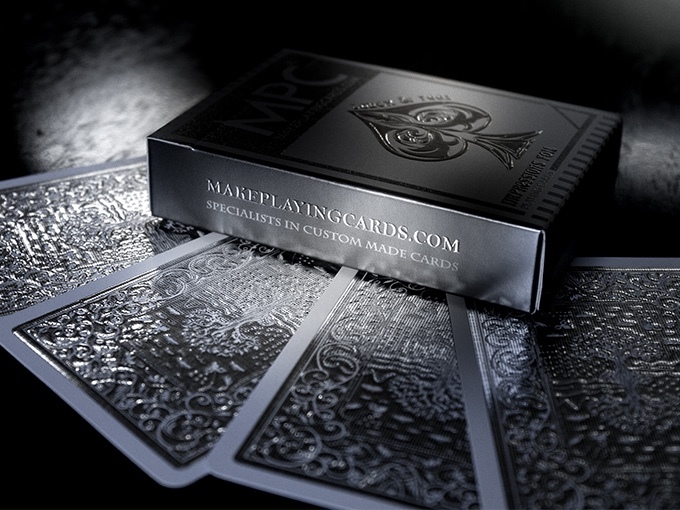 High gloss embossed metallic back playing cards using ground breaking print technology. 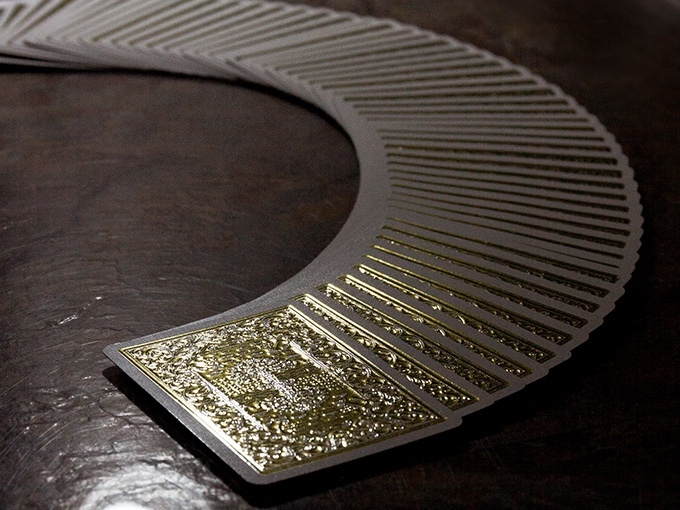 Great for Poker, Cardistry & Magic. 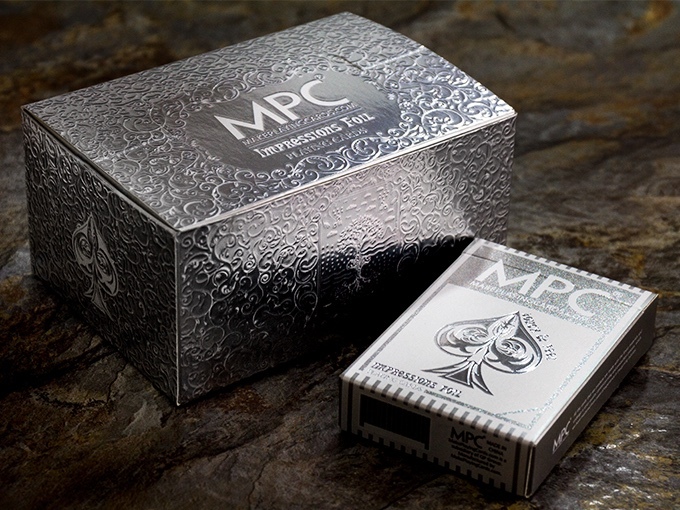 The Impressions Foil Playing Cards Series are designed and manufactured by MakePlayingCards.com (MPC®), a leading tabletop games printing and manufacturing company of over 35 years. Our highly successful dynamic website allows users to create their own professional playing cards using a simple to use but revolutionary drag and drop online maker. 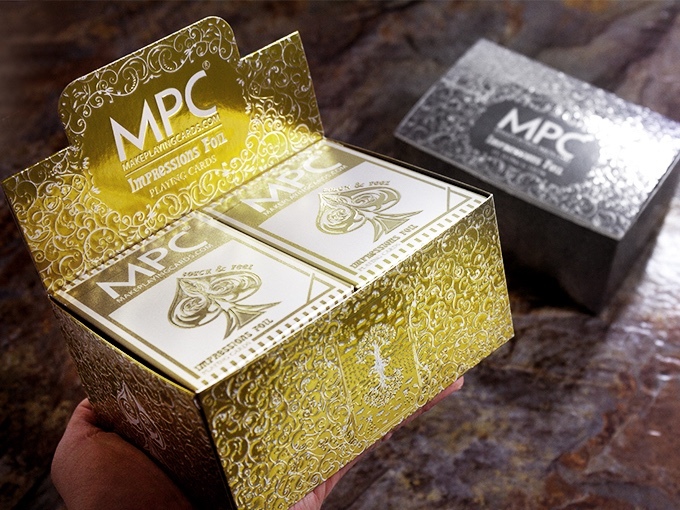 We introduced the MPC Impressions Foil Playing Cards in our previous hugely successful Kickstarter projects. During the course of time, we found that there was a clear demand for more color versions using this new and very impressive technology. Gold and Silver embossed foil backs were the obvious choice for us to add to this ever popular and growing range which is what we have for you in this project. We absolutely love these and hope you do too. 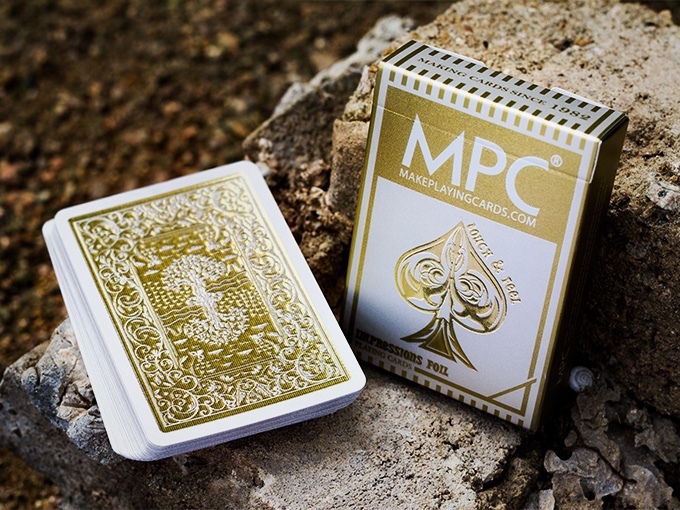 These very special decks are developed and created by the MPC team using a technique called high gloss embossing with a metallic layer fused in to bring a very glossy looking gold and silver finish that is both extremely eye catching as well as providing a unique touch and feel aspect to the cards that has to be seen and felt to be really appreciated. Arriving at the chosen shade of gold and silver was a huge task in itself as we had gone through many different color shades and production tweaks until we were truly happy. We settled on the color shades that is able to best depict luxuriousness and also best complements each other. 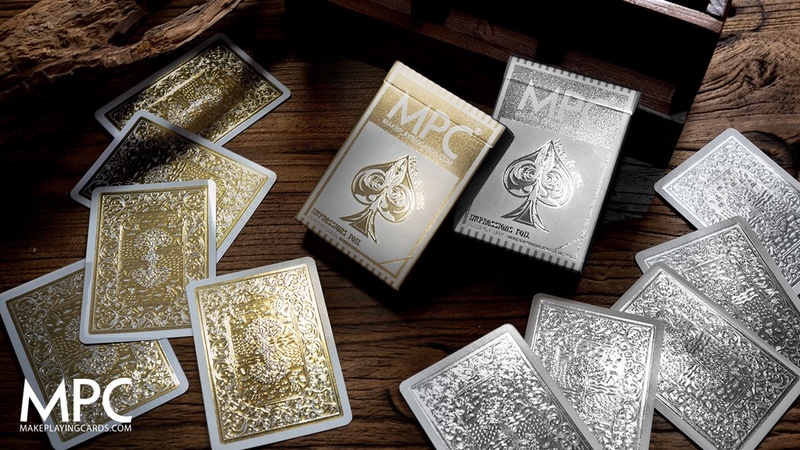 The technology used in these are exclusive to the MPC brand, while metallic themed cards have been around before they are typically printed using metallic ink or being made from foil material that is not actual playing card stock, resulting in poorer handling. 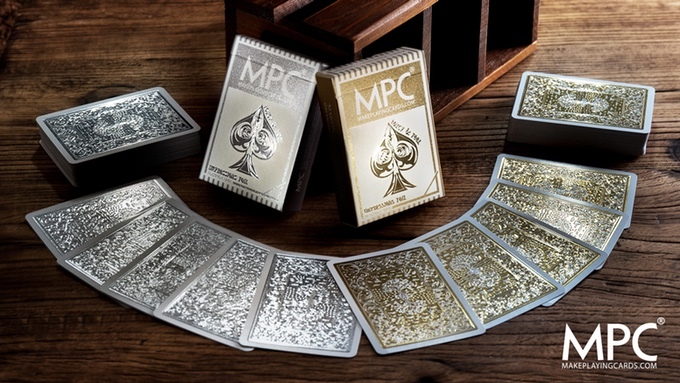 The Impressions Foil decks is made from premium grade professional card stock with air pockets so even though they look very impressive they also offer superior handling which is required for cardists and magicians. Further to our previous Impressions decks, we have been actively developing and made even more improvements in the printing and manufacturing process to provide even sharper colors and smoother handling for playability. 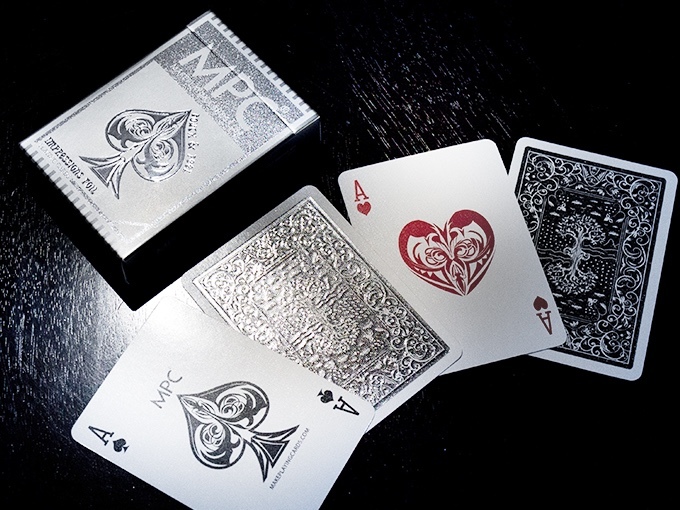 This is one of the most surprising elements of these playing cards that we are very proud of. As well as looking amazing, they are also very playable which offers the perfect mix of smoothness and friction to allow the cards to be handled like a professional deck of playing cards. These decks are designed to be used as normal for performance by magicians, cardists or just for normal card game playing, as opposed to being a collectors deck or for simply showing off to your friends. Getting the cards up to where we are now was no easy task as it required many prototypes and multiple trial and error methods to achieve what we want. We have been asked before will the texture on these cards crack when handled or bent and the answer to that is definitely no as the gloss applied is highly flexible. 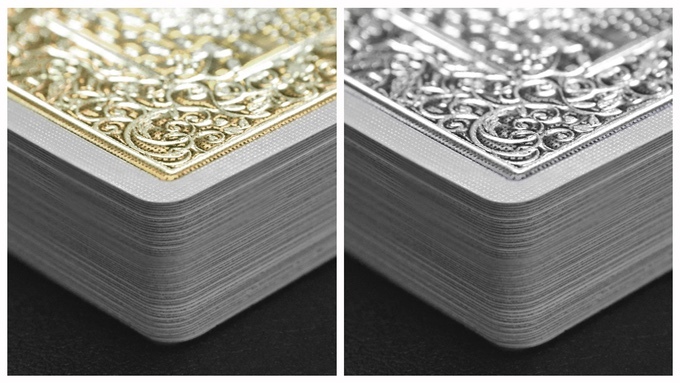 Adding this special raised embossed effect to the playing cards makes a full deck around 5 cards taller than when compared to a regular card deck. The small added thickness will not affect handling and may even prove to be a benefit for bigger hands. The metallic bricks are limited editions to this Kickstarter only. Covered in gold foil (or silver for the silver brick) and with a layer of high gloss to bring it to life, this really is something else and nothing short of amazing. 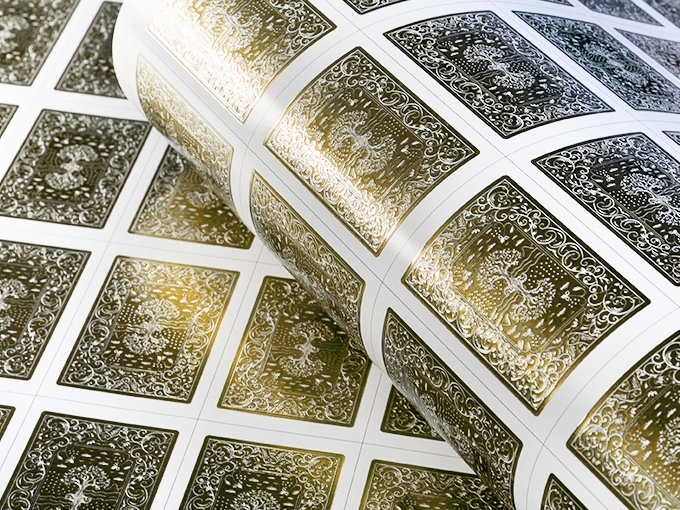 High glossed gold and silver foiled uncut sheets is definitely one for the collectors. Looks amazing on the wall.